Other Names: visha, Indian Atees, Vaj-turki, Vajji-turki, Atis, Upavishaaka, Ativisha, Sitashringi, Ataicha, Pankura, Atavasa, Bhangura, Ateicha, Ativasu, Athivisha, Ativadayam, Atirasa. Additional Info: The herb is applied in Ayurvedic medicine. It is native to alpine areas and Himalayas from Kumaon to Indus. Elements Applied: Dry roots are commonly applied in herbal medicine. Used For: The roots are known to energize the system, boost sexual desire, reduce flatulence, prevent the reappearance of fever, cure stomach conditions and fight diarrhea. The remedy is applied in the following conditions: vomiting, liver disorders, indigestion, piles, edema, dysentery, diarrhea, debility, cough, fever reappearance, and strong inflammations. 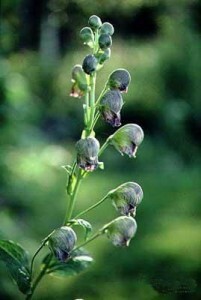 Aconitum is a potent remedy for recurrent fevers. It produces a strong energizing effect on the organism and boosts libido. It is additionally applied for dysentery, dyspepsia and coughs. There are several mixtures with other herbs to fight fevers. The extract powder in combination with honey is applied as a potent remedy for fevers, coughs, and vomiting in children. The dose should be determined according to the age. The mixture is put to the tongue. In case of bilious fevers, aconite root in a quantity of 1 dr. is combined with bonduc root in a quantity of 2 drs., and crumbled up to powder. To fight recurrent fevers the natural combination of this kind is suggested: Mix one part each of Delphinum denudatum, Cyperus rotundus, chiretta, and aconite root. The combination is crumbled up to powder. The dosage commonly applied is half a drachma to one drachma. Preparation and Intake: In form of tincture the plant is applied in a dose of 20 drops on average. In form of powder the herb is applied in a dose of 20 grains on average. Additionally used in form of decoction.